As we all know, the original JH master cylinder is long gone. 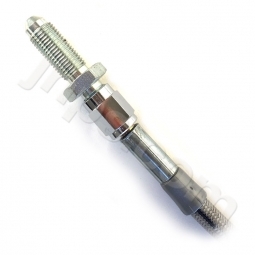 This brand new, quality made TRW-Lucas unit is an EXACT replacement bolt on unit. The reservoir differs in appearance only and otherwise fits perfectly under the bonnet. Brake hose position is the same. Installation is the same as the original master and no other parts are needed. Don't mess around with your brakes! I've cheated death on several occasions because of faulty hydraulics, don't be cheap when it comes to brake safety. This new master cylinder unit will make your Jensen Healey brake like new and provide years of reliable service. These are newly manufactured units, direct from Lucas, not old junk sitting around for decades or bogus knock-offs from Asia. Tech Tip: We recommend you use ONLY Castrol GT LMA DOT 4 brake fluid. The British rubber components inside these units (and most British vehicles built today) are designed to use high-quality, conventional (mineral) brake fluid. The use of synthetic brake fluid is NOT recommended and can cause swelling in some circumstances and lead to brake failure.